The worlds of ski slopes, frigid city streets, and fashion shows collide in the design of the Obermeyer Cosima Down Ski Jacket. Cut like a form-flattering everyday down jacket, the Cosima is a full-blown ski jacket in disguise, offering 15K waterproof-breathable protection. So carve through the snow and never worry about soaking or freezing through. The stretch polyester also keeps you moving, so nothing will hold you back. And this jacket is loaded with features, everything from a removable down-filled hood, to Control Zone Ventilation, to a detachable goggle cloth. Look and ski your best. "What color is the zippers?" "The Obermeyer Cosima Down Ski Jacket zipper is a violet purple. We hope this information helps!" "Thank you for your inquiry. Yes, the hood is helmet compatible. We hope this information helps!" "Is the Cosima hood helmet compatible?" "The hood on the Obermeyer Cosima Down Ski Jacket is helmet compatible. Hope this information helps!" "It's been so frigid lately. Which is warmer the Obermeyer Cosima or the Kitzbuhel?" "The Obermeyer Cosima jacket will provide more warmth. It is a down insulated jacket which will insulate the body more during the colder temperatures. Hope this information helps. " "Looking at the Devon vs Cosima... Thoughts on which jacket is warmer? Is one more comfortable or stretchy than the other? Also, should I order a size up from my normal jacket size in order to fit layers underneath, or will bulky layers not be needed to keep warm in 15 degrees F?" "Both the Obermeyer Cosima and Devon have a warmth rating of 10/10 (both are great for temperature 15 degrees and below). Both of these jackets have down insulation. The Cosima has a polyester stretch fabric and the Devon does not. With the correct baselayers, bulky layers will not be needed with either jacket. Hope this information helps!" "Hi! Very interested in this jacket, love idea of wearing 1 layer underneath. Only concern is will this jacket be too warm on 25-30 degree Colorado days?" "The Cosima is one Obermeyer's warmest jackets. It is rated a 10/10 for warmth and is ideal for temperatures of 15°F and below. Although it does have underarm vents for warmer days, it may be too warm for Colorado spring skiing. Hope this information helps!" "What color is the jacket in the video?" "The color of the Obermeyer Cosima Down Ski Jacket in the video is VIOLET VIBE. Hope this information helps!" "Does the cosima have a interior goggle pocket? 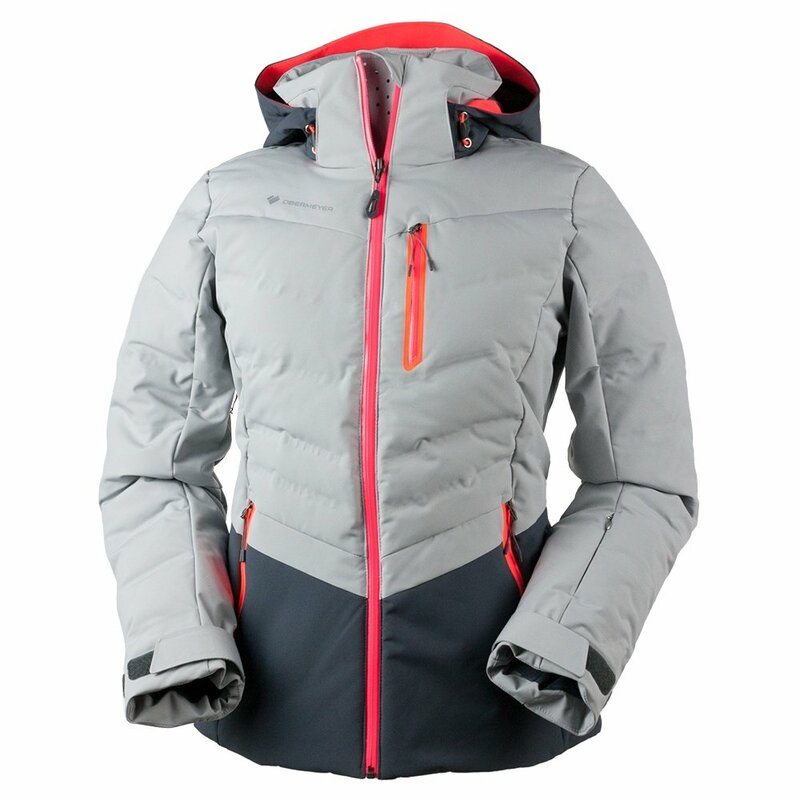 Looking for a warm yet feminine jacket with exterior pockets, large interior pocket and a goggle pocket. I have an ancient obermeyer leighton that is ready for retirement." "The Obermeyer Cosima has 4 exterior zippered pockets: 2 waist, 1 chest and 1 sleeve. The interior has a stretch mesh stash pocket with a detachable goggle wipe and a large chest pocket. Hope this information helps!" I bought this to ski in michigan winters, after trying on many different coats and speaking with obermeyer customer service, this cosima down jacket seemed to have the features (especially warmth) that I wanted. I'm so glad I bought it--it is great, has kept me very warm. i generally wear a size 2-4 but had been able to try several obermeyer coats (different styles) in local ski shops and it seemed like a size 6 was good for me--and it is perfect. not tight across the shoulders, good sleeve length for me.